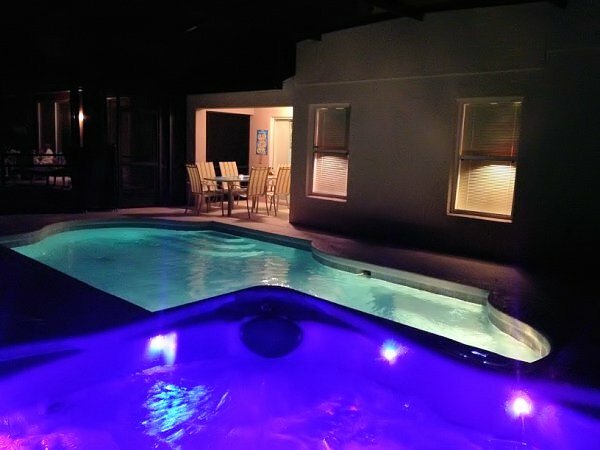 with its own private heated swimming pool and SPA is just minutes from the MAGIC! 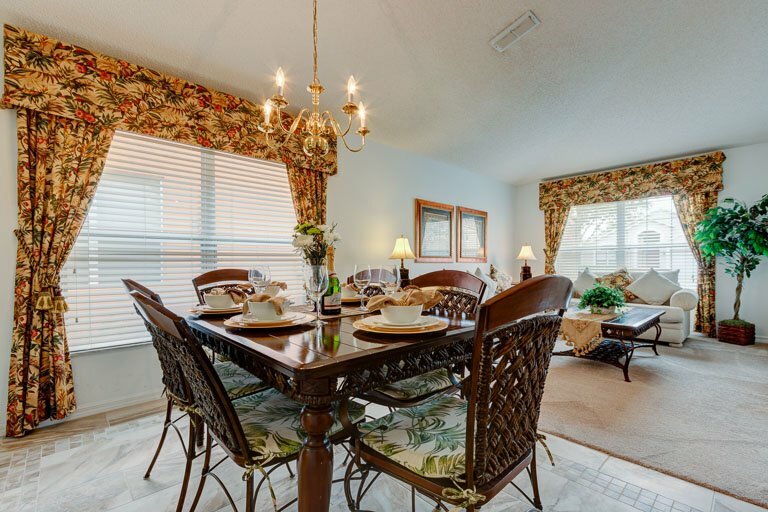 Our beautiful Florida holiday home with private pool, is set in the peaceful and tranquil location of Emerald Island Resort, a gated community. 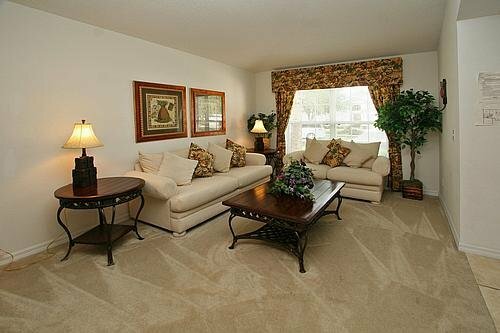 Extremely affordable but with every possible resort style amenity at your disposal, yet it is only minutes from Disney World and close to Universal Studios and SeaWorld and is superbly positioned for access to all the other theme parks and attractions! The 2 story executive style Villa has 4 bedrooms 3 bathrooms, ensuring plenty of individual living space. The villa overlooks a conservation woodland nature reserve and the private pool and spa area is not overlooked by other properties from the rear. The entire house is air-conditioned and tastefully decorated with TVs throughout, with a family room-sitting room- formal dining area - breakfast nook fitted kitchen and games room. This fabulous villa has been thoughtfully furnished by it’s owners to create a vacation home with a stylish contemporary feel. "Review of Villa for guest staying 08/27/2016-09/10/2016 Accommodation ---- (5 = Excellent,) Quality of the accommodation - 5. Quality of the bedrooms - 5. Cleanliness of the accommodation - 5. Cleanliness of the swimming pool - 5. The location of the accommodation - 5. Any further comments on the accommodation - The accommodation was second to none. We were completely overwhelmed by the attention to detail and were extremely pleased with the villa. The decor was splendid and the huge Egyptian cloth in the main area was amazing! All the rooms were suitably decorated and the beds were extremely comfortable (in fact we meant to take a look at the make so we could research getting one back in England!) 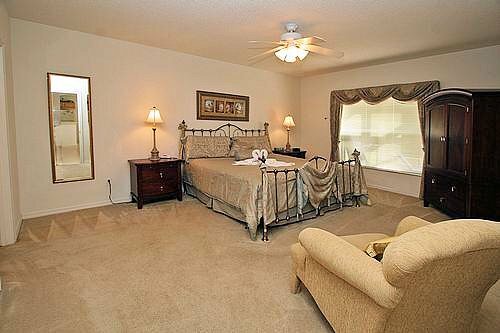 The bedding was plush and comfy"
"We had a great time.The house was very roomy.We loved having the game room and heated pool. The house was even more pretty than the web pics. This was our first time renting a house. We would do it again. The location is convenient to the different parks. We came home late afternoon to rest and went back to the parks til closing~most days. Albrigh & Davis families. Virginia "
"Good value for money, plenty of space within property & kids loved games room. Air conditioning unit very noisy especially through the night which meant it did disturb people sleeping in one of the bedrooms. Overall would recommend property, gated community very nice and felt very secure. Close to all the parks Rebecca, Bristol, "
"Well looked after property that was perfect for our need’s. 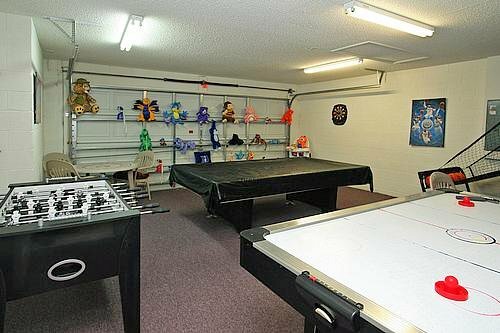 The games room in the garage is a good idea and was well used by all of us on a nightly basis,this was a life saver at the end of a busy day. It was good to take a few dollars off my son and his friend at pool!! (Ha ha).We will definitely be happy to visit this villa again. The only negative point would be that due to the layout of the Villa we did not have the sun on the pool area after about 3pm, but if you have pool heat as we did, it wont spoil your fun. We hope others will enjoy their visit to Key Cove as we did!! Ady (UK) Adrian, Leicester, "
"My family and I (11 of us) stayed together in this house. It was absolutely beautiful.We enjoyed the peaceful neighbourhood. It was a great place to relax after a long day at the parks. The home was beautifully decorated. 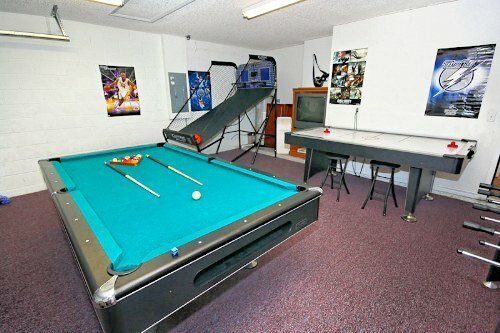 The kids enjoyed the game room/garage. 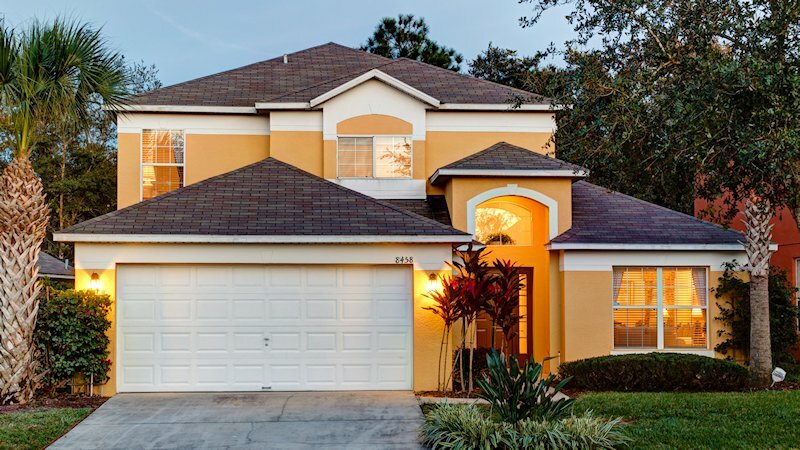 Having a home in Orlando was definitely the way to go.We were very pleased with the cleanliness of the home. It was perfect. Thank You! Thank You! Thank You! Best Regards from my family to yours Charlotte, Massachusetts USA "
"A really beautiful villa. We have rented many times in Florida but found this to be one of the best. Downside is that the pool is not as large as we have had in the past and also barbequing is not allowed. Upside is that the villa was very clean,well equipped and had everything we required for a 2 week holiday. Games room was a bonus for the odd ’exhausted from the theme park’ times! 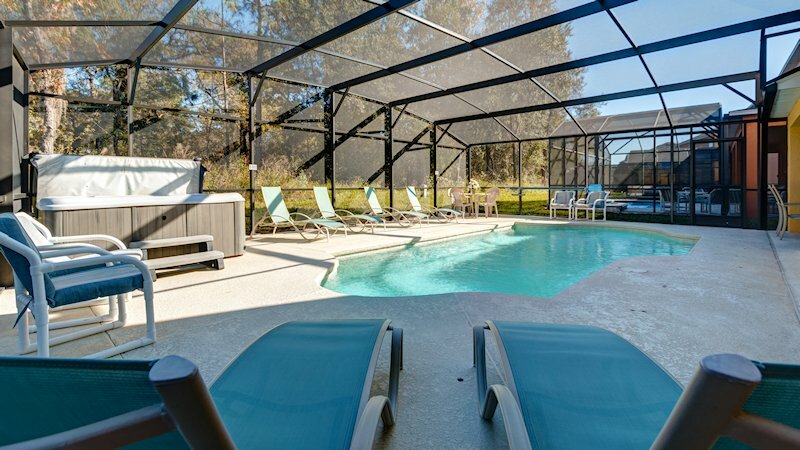 Loved to sit at the poolside overlooking the woods.Close to Disney,192 and International Drive, but far enough away not be involved in the ’hurly burly’!We found the staff at the Welcome Homes Office to be very helpful and friendly.Our major complaint was that we had to leave!!!!! Lynn, Massachusetts, USA "
"Wow this vacation home is something else. 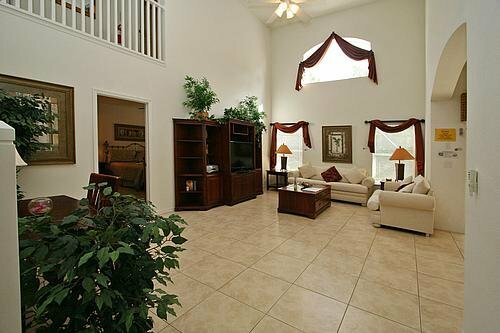 Everything from the decor, level of comfort, amenities, grounds, clubhouse and proximity to all major attractions makes this rental the place to stay in Florida. I most definitely will be back!!! Ciara,Dublin "
Our spa is a stand alone real spa. BBQ should you request it is $50 per week including gas. Emerald Island is a newer upmarket gated community, hidden away amongst woodland and offering executive villas, with the added benefit of a clubhouse and all the facilities you would expect from a holiday resort. 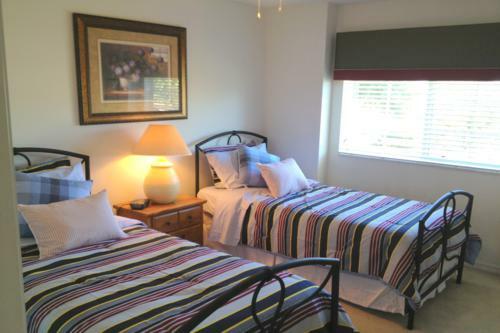 Boasting excellent community facilities centered around the huge clubhouse, guests have use of the community pool and sunbathing area, spa and sauna, gym and exercise room, games arcade and an internet cafe. Outside, there are tennis courts and basketball courts for the more sporty and children's play areas for the toddlers. All this and nature trails around the surrounding conversation and woodland area. Heading around 2 miles towards US192, there is the Formosa Gardens Village shopping complex, which has a supermarket, pharmacy, walk-in medical centre, liquor store and a selection of other shops (including an ATM cash machine). For eating out, there is a selection of restaurants and eateries, which include an Outback Steakhouse, Red Lobster, TGI Fridays, Giordano's Italian restaurant, as well as both a Chinese take-away and Japanese sushi bar. For quick snacks, there is also a Subway, Taco Bell and Dairy Queen. Heading onto US192 towards Kissimmee, you will find countless restaurants for eating out and an almost equal number of themed crazy golf to work off the meal! As you first enter the luxurious villa, you first see the spacious contemporary styled living room with 2 comfortable sofas with the dining area located to the rear of the room. The formal dining area is located adjacent to the living room and has a large table with seating for up to 6 diners and is beautifully set out for those special dining occasions. Stylish glass topped wrought iron table with matching chairs to enjoy an indoor breakfast, lunch or dinner. This wonderful contemporary styled bedroom located off the family room, is furnished with a super comfortable King sized bed with matching furnishings and provides a large walk-in closet and ample drawer space. This room faces onto the pool deck, and has its own TV with DVD and alarm clock radio. The enclosed en-suite bathroom has his & hers vanity units, large walk-in shower unit and separate WC cubicle. There is also a hairdryer in the vanity unit. Off the en-suite is the large walk-in closet. This bedroom features a queen sized bed and built-in wardrobe. Ceiling fan Air-con Additional features include a TV armour and alarm clock radio. This bedroom features twin beds and a built-in wardrobe. Additional features include a TV. This bedroom features a 4 posted double bed and a built-in wardrobe. Additional features include a TV and alarm clock radio. This large shared bathroom at the top of the stairs and in between bedrooms 3 & 4, features a single vanity unit, bath with shower over and WC. This shared bathroom next to the laundry room, on the ground floor features a single vanity unit, shower cubicle and WC and wash hand basin. Pool & Spa by day - Perfect after a day at the parks. New Free standing pool Hot-Tub Spa! 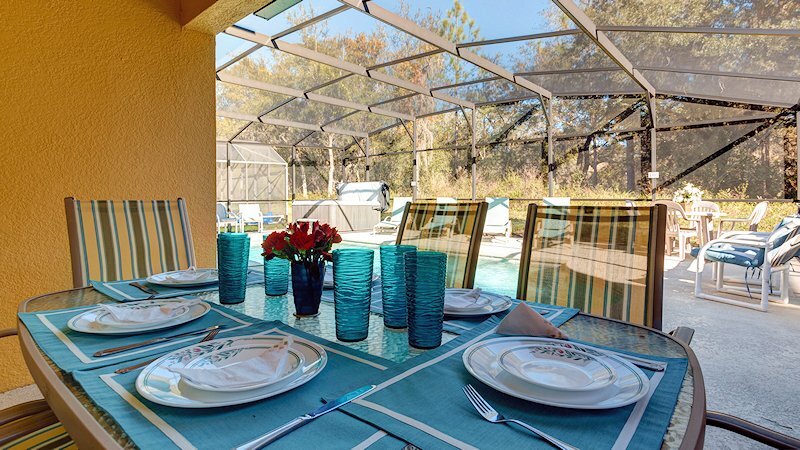 The covered pool deck with large pool offers pleasant conservation woodland views to the rear and is the perfect place to sunbathe and relax in the Florida sunshine. The pool area is provided with 1 x table, 6 x chairs and 4 x sun-loungers for your enjoyment and comfort. The pool can be heated for an additional daily charge (recommended from October to April) but for those really hot days of summer, you can keep cool as you sip iced drinks by the pool. A pool safety fence is also provided to ensure toddler safety by the poolside. After a day at the parks, Hit the games room!! 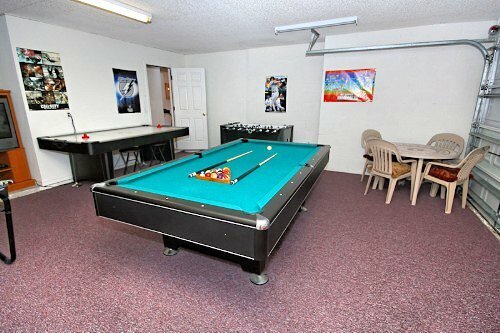 The GAMES ROOM with air-conditioning includes a Pool Table, Air Hockey, Foosball, Darts. All telephone calls are included so you can keep in touch with loved ones back home and not worry about the cost.